Look at me achieving things. Time for another update...very tight at the top! I'll be the first to say that only about 10% of my posts this month have been actually helpful. No more updates now until the final table on Monday. Is Chlorophile's lead unassailable, or can anyone catch him...? Made the top 50 is so going on my CV. I'll try to start posting more. 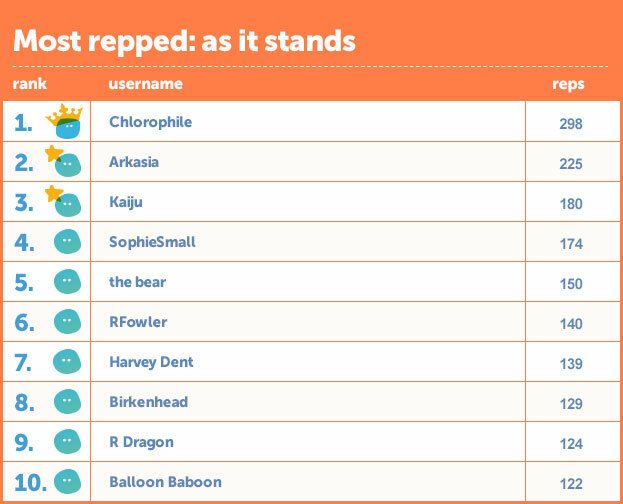 Maybe I'll make the top 20 in Dec.
Oh gosh, I've never been on a leaderboard before, never mind the runners up listings! Can runner up get a prize as well?